Today was an exciting day! I just flew back from NYC, where I’ve been hanging out for a week to meet with my team mates (Team Social FTW). After some well deserved sleep, I headed out to Queen of Hearts tattoo parlor for an appointment with my favorite tattoo artist – Pedro Mascarenhas (yeah… flash website… I know…)- to get some fresh ink in me. As most of you know, I’ve been a WordPress enthusiast for quite some time (2005-ish). WordPress, as a platform and community, has been a very important part of who I am today as a web designer and as a person. Therefore, getting a WordPress related tattoo makes perfect sense. The decision to tattoo something WordPress related is not necessarily because of my new job at Automattic, although it kinda served as a catalyst – the icing on the cake – for me to go through with it! I’m really proud of these tattoos. Hope y’all like it too! I might just consider it. Ha. I see you like poetry of the code variety. If you’re in the mood for the more usual sort of poetry, please stop by my cozy little corner sometime and let me know what you think. Oh, and we have one more thing in common: I like WordPress too. Congratulations on all of it, the job and the ink! “Code is Poetry” looks great! Nice, I want one 😀 WordPress for life! Nice work. The tattoos look good and are original – not something you see often. As an accountant, I’m now wondering if I should get an excel spreadsheet tattooed on my shoulder, with ‘Numbers are boring’ written on my forearm…possibly not! I am never getting a tattoo! Wow, beautiful tattoos! Looks amazing! Thanks for sharing your story! Man, you really love WordPress! That tattoo artist is good. Wow, you really appreciate wordpress, don’t you?? Your tattoos looks nice btw.! OUCH!!! Well, that’s dedication. Maybe helps secure your position when another round of dismissals is under consideration- “But He’s REALLY dedicated! Didn’t you SEE his tatoos?” heh heh. I personally have no tatoos because I beleive art belongs on paper or canvas. But I guess you and others see your skin and body as a surface worthy of art. To each his own! Congrats on freshly Pressed. that’s pretty cool, but are you sure you’d like that when you’re 60 or something, when you’d look back at this moment? although it’s really cool…..i know i wouldn’t if i were you…..but i’d like to know what you think? Every Tattoo I place on my body goes through a long process of thinking, so I’m sure that it’s something I want for life. All of them (I have quite a lot now, started when I was 15) mean something important. It’s not something I do lightly… For example, these WP tattoos have been on my mind for around a year before I actually got them! Wow! Now that’s what I call devotion. Hey whatever turns you on it’s a free country and we all need a laugh. Congratulations! I like the irony of inking these designs onto your body when there is no actual ink involved in WordPress. Virtual reality meets reality ‘in the flesh’. Brave man. wow! That’s real commitment! And nice art work, too. 🙂 Worthy of freshly pressed status for sure. Did you know you were going to be freshly pressed? Congrats on your new job with Automattic & on being FP (even if you already knew:)). I had no idea! The title of the post was meant as a pun (actually my original tweet was “Freshly Branded”, but then I though this looked cooler). That got me to be on Freshly Pressed wich is AWESOME! I only realized that when I saw the crazy amount of trafic and comments on this post… it’s just crazy! Wow, Hugo. I don’t think I’m willing to go quite this far to make the Freshly Pressed home page! lol Way to go. I love, lOvE, LOVE WordPress, as well. Want to learn more. Love your tat. Wish I was brave enough to take the needle. They both look awesome!!! Congrats!!! Fresh Ink and Freshly Pressed … rockin’. As long as you are sure of what you want to get tattooed on you, I say go for it! wow…your on freshly pressed…what a coincidence!!! lol congrats! nice post by the way! Wow, talk about committment to WP! Great looking tattoos, especially impressive how straight the lines are – from what I’ve learned that’s a sign of the artist being very experienced. Now you really took the theme “Freshly Pressed” to a more literal term lol Nice tat! Freshly pressed indeed! Congrats on being freshly pressed in the flesh and on WordPress! And congrats on the new job adventure! Very cool post! Wow…so that’s all you have to do to be Freshly Pressed? Just get a silly little permanent, painful, excruciating tattoo? The inner part of the arm is generally an easy area to tattoo, as long as you don’t go too much towards the wrist or the elbow joint! That’s real dedication to getting featured on Freshly Pressed…. lol. Now I see what is required to get my blog featured on Freshly Pressed. I wish someone had told me earlier. What?!?!? A pun??? Now how in the world am I supposed to get rid of this new tattoo? Awesome tattoos Hugo! The “Code is Poetry” one looks stellar. Love it ……..I like the hands crawling in the background. Good Pics. Wow! 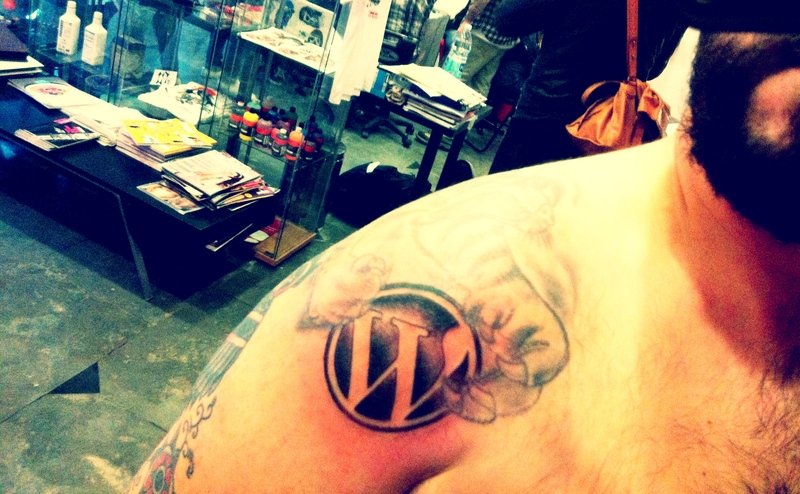 WordPress tats. You must be one dedicated blogger. Woah, I’m really impressed. I would never be able to go through something like that. 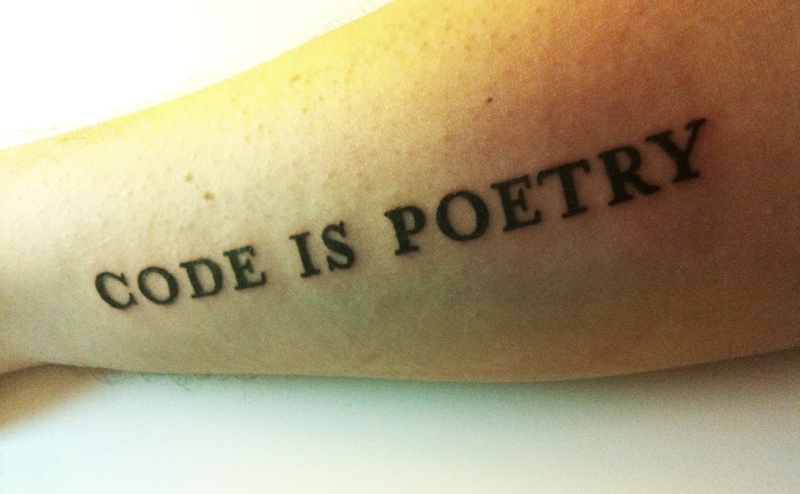 I love the “Code Is Poetry ” tat. Has me thinking of some ideas for a new one for myself. The tats and your dedication are inspiring. You ARE a serious WordPresser! Loh! amazing, its shows a real dedication. Awesome! You are a true, dedicated WordPress member. Hugo, first off congrats on getting Freshly Pressed on Word Press and on your body! I just became aware of your blog, but now I am a follower. Once again congrats on all of your success. Wow and ouch .. doesn’t look like it hurt at all. True dedication for sure! I guess in these tough times, it is one way to show loyality to a company and insure job security. I know the saying dealing with the word “Poetry,” does not really mean poetry from a creative point of view. Come to think of it, I have had a poetry blog with WordPress (two to be exact) totaling over thirty thousand hits, over a five year period, but have yet to see a “Freshly Pressed” (Not that mine is of the calibre to qualify) WordPress Poetry site. Hey dude, really liking the look and feel of your work and the word-press body work is cool too, well done for believing. Anyway, keep up the good work man. Thanks. Hey there Dan! Thanks for the comment and congratulations on your new blog!! Freshly Pressed tattoo and Freshly pressed blog! Cool. So, what you saying is this: you want to be on the front page of WordPress, than get a WordPress Tattoo. bribery gets you anything. I hope you never get mad at WordPress. haha. 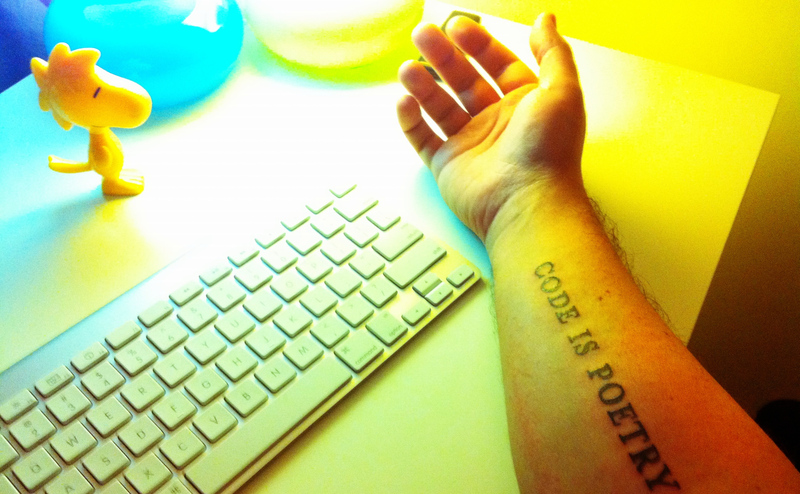 I do like the “Code is Poetry”. Great tattoos! I especially love the “code is poetry” one. Fantastic. 🙂 Now if only I had the nerve to get some tattoos that have been on my mind. Wow, crazy! You’ve been on here for a while!! And your tattoo is awesome did you draw I out? Or the artist did? I there a reason behind the colors he chose? It would be wrong if you didn’t get on Freshly Pressed. CONGRATS! Wow, props to you! They look so cool! Oh, thanks a lot, now I want a tattoo even more! No but seriously, great post and great body art. Congrats on freshly pressed. You are completely loco, and dedicated too. Tahnks for sharing! Hope they look that good when you reach 60! I have experienced enough surgeries to steer clear of needles, knives and hospitals. The wordpress one looks great, love the little quote as well, both are done very well! But the wordpress one has to be numero 1 in my book lol.